The 2010 Icelandic volcanic eruption, which disrupted European flights, also had a "significant but short-lived" impact on ocean life, a study shows. Ash from the Eyjafjallajokull volcano deposited dissolved iron into the North Atlantic, triggering a plankton bloom. 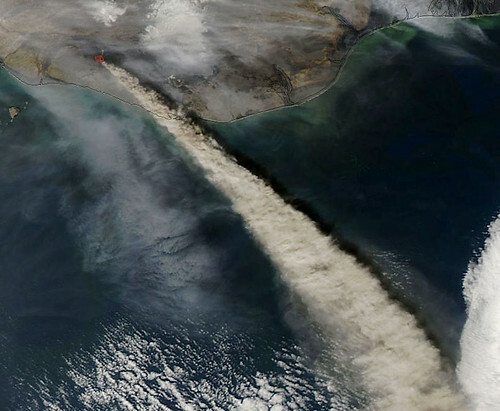 Ash from the Eyjafjallajokull volcano deposited dissolved iron into the North Atlantic, triggering a plankton bloom. The authors said it was good fortune they were at sea at the time as it provided a unique opportunity to sample the ocean during a volcanic eruption. The findings appear in the Geophysical Research Letters journal. In April 2010, the eruption sent an ash plume several kilometres into the atmosphere, causing ash to deposited across up to 570,000 sq km of the North Atlantic Ocean. The five-week volcanic activity was still ongoing when a team of researchers arrived in the Iceland Basin region aboard a research vessel. "Our study was unique in the sense that we were the first to undertake sampling at sea of volcanic ash deposition and the chemical and biological effects in the surface ocean," explained lead author Eric Achterberg from the National Oceanography Centre Southampton, UK. "In addition, we were able to sample the ocean region again a few months after the eruption and observe the changes since the eruption. "The opportunity to sample during the eruption and also a couple of months after the event allowed us to obtain a unique insight into the effects of the ash deposition on the biology and chemistry of the Iceland Basin." Three years earlier, the team had shown that the production of phytoplankton - microscopic plants that form a key component of marine food chains - was limited by the availability of dissolved iron, which was essential for the tiny plants' growth. Prof Achterberg told BBC News what the in-situ team was able to record: "Biological experiments showed that the volcanic ash released the iron that stimulated phytoplankton growth. "The effect of the volcanic ash inputs were nevertheless short-lived as the extra iron supplied by the volcano resulted in rapid biological nitrate removal, thereby causing nitrogen limitation of the phytoplankton population." So while the additional dissolved iron triggered an earlier-than-usual phytoplankton bloom, as the metal triggered growth in a greater number of phytoplankton cells, the bloom was only 15-20% larger than normal because the growth was limited by the amount of available nitrogen, another vital ingredient required for the organisms to develop. As well as playing an important role in food chains, phytoplankton also absorb carbon dioxide from the atmosphere. Oceans are considered to be one of the planet major players in the global carbon cycle, but the carbon uptake in the region where the eruption occurred has limited capacity. "The high latitude North Atlantic Ocean is a globally important ocean region, as it is a sink for atmospheric carbon dioxide and an area where deep water formation takes place," Prof Achterberg observed. "A limit to the availability of iron in this region means that the ocean is less efficient in its uptake of atmospheric carbon dioxide." However during the bloom triggered by the ash deposits from the eruption, the team recorded that it was a shortage of nitrogen that limited the size of the phytoplankton bloom and - as a result - the volume of carbon dioxide uptake. Prof Achterberg concluded: "The 2010 Eyjafjallajokull eruption therefore resulted in a significant but short lived perturbation to the biogeochemistry of the Iceland Basin."